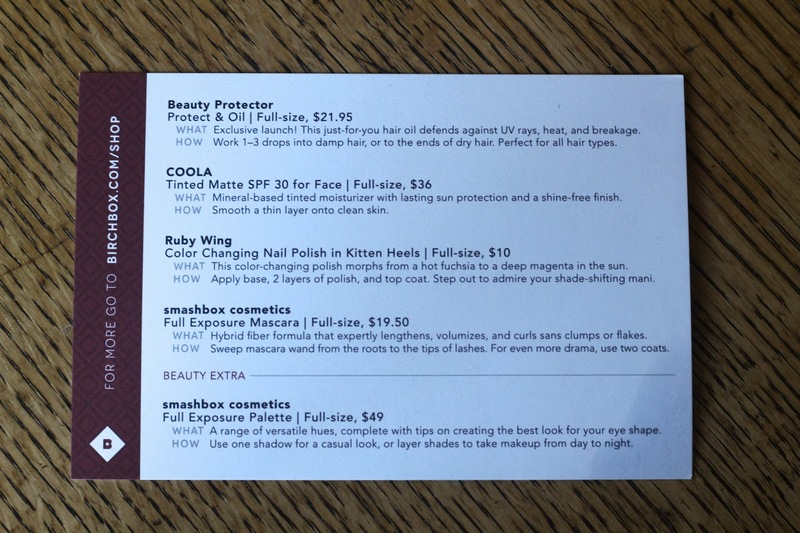 I have two Birchbox subscriptions, and this is the review for my second box, which is on my alt account. I was pretty excited to get this version because of the palette and other "big ticket" items, but my Beauty Protector oil was broken in transit damaging the eyeshadow palette as well. 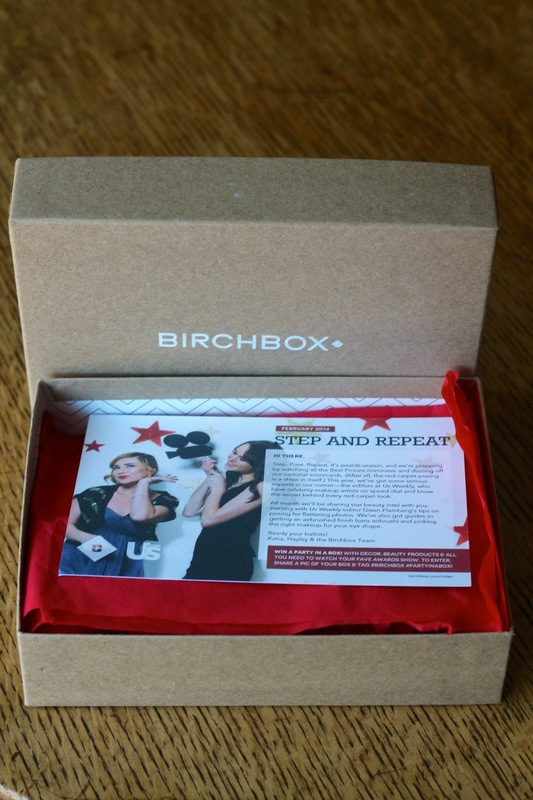 This Birchbox arrived in 9 days, from New Jersey to California, and is shipped UPS then delivered by USPS. Info card with the items I received. COOLA Tinted Matte SPF 30 for Face - ($3.50) This is very lightly tinted which is perfect for my light skin tone. I'll be interested to try it especially in the coming months when I worry about wearing sunscreen. Ruby Wing Color Changing Nail Polish in Kitten Heels - ($5) I received the glitter version of this in another Birchbox so I was glad I didn't get a duplicate. Smashbox Cosmetics Full Exposure Mascara - ($7) I guess it's nice to be able to try various brands of mascara, but I have an overload of mascara. I got 2 in my last 2 Birchboxes now another one? I'll have to decide if I want to try this or try to swap it. Beauty Protector Protect & Oil - ($3) I received this broken in transit, leaked all over my box and destroyed the palette. I've contacted customer service about a replacement, I'm anxious to try. 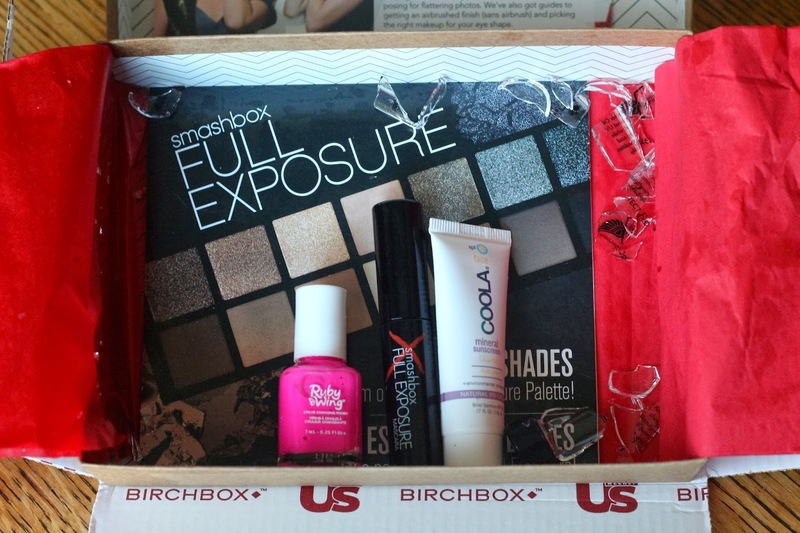 Smashbox Cosmetics Full Exposure Palette - (~$3) Was damaged from the leaked oil, so I'll have to wait for a replacement to try it. All totaled, my second February Birchbox was worth about $21.50 and I can't forget the $5 in points I receive for reviewing my products! Because my oil leaked and I couldn't try that or the palette I'll have to wait to make a judgment on those. I've emailed Birchbox customer service about them, and they are sending a replacement box.